Chef Christian Hayes, co-owner of the Yarmouth-based Dandelion Catering, was the "Chopped" champion on Food Network Tuesday night. Christian Hayes, chef and co-owner of Yarmouth’s Dandelion Catering Co., won the $10,000 prize as the top finisher on the Food Network’s popular cooking competition show “Chopped” Tuesday night. Tuesday night’s episode, titled “Pork on the Brain,” pitted four chefs from around the country against each other in preparing three pork-related courses for a panel of celebrity chef judges. 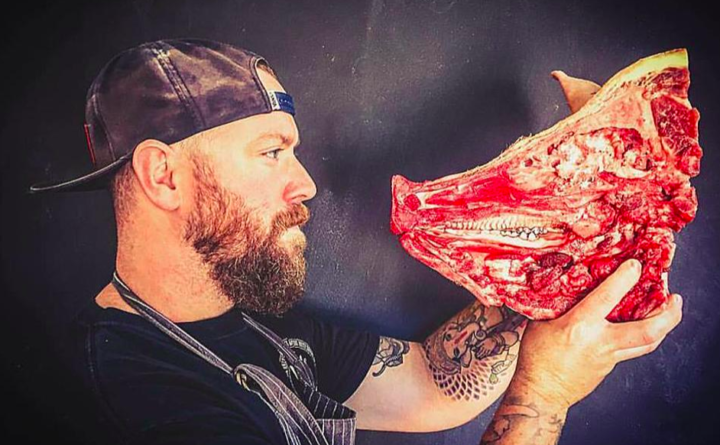 According to longtime friend and former Sidecar Radio bandmate Jason Stewart, Hayes whipped up a dish of creamed pork brains in the second round of the competition and dark chocolate pork blood pudding for dessert on his way to becoming “Chopped” champion. Stewart recapped the episode in a post for Q106.5 FM, the Bangor country music radio station where he works as a DJ.